Ask any mom; if there’s anything better than shopping clothes for yourself, it’s shopping clothes for your kids. Scotch&Soda seem to understand this very well with their beautiful Shrunk (boys) and R’belle (girls) collections. 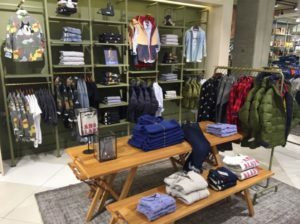 As a preferred supplier, Imagebuilders has the honor to produce and roll out the new interior of several shop-in-shops for these lovely clothing lines. At the moment all in the Netherlands, but there will follow some abroad as well. When it comes to materials, the fixtures look a lot like the main Scotch & Soda concept, with brass and glass. They are however especially designed and produced for children. The Shrunk concept is characterized by a khaki green color, while R’Belle is powder pink. We’re proud to produce and roll out these little shopping paradises for mommies!